In our off-season overview of the San Jose Sharks we wondered if the team was ready to move on from long-time goaltender Evgeni Nabokov. It looks like we got our answer today. The San Jose Sharks will have another starting goaltender next season. San Jose Executive VP and General Manager Doug Wilson met with longtime starter Evgeni Nabokov on Tuesday and told him the team will not offer a contract when the soon-to-be 35-year-old goaltender becomes an unrestricted free agent on July 1. Wilson said the decision to look elsewhere for goaltending was simply a matter of allocating money under the salary cap. The Sharks may rely on Thomas Greiss, or one of the many goalies stockpiled in their system including their top AHL backstop Alex Stalock, or Tyson Sexsmith... or Harri Sateri... or Carter Hutton... or Thomas Heemskerk. San Jose has been a virtual goaltending factory with Nabokov, Miikka Kiprusoff and Vesa Toskala all spending time in the Sharks crease. 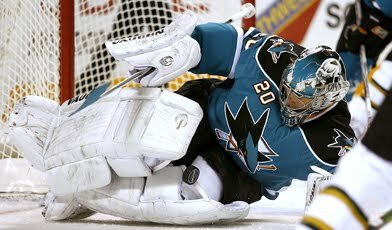 If their latest crop only is a collection of cool names, San Jose also has the opportunity to pursue other free agent options like Chris Mason, Dan Ellis, Jose Theodore, Ray Emery, Marty Turco, Marty Biron, the aforemention, former Shark Toskala, among others. In short, it probably signals that Wilson would like to retain some, if not all of their other pending free agents like Patrick Marleau, Patrick Marleau, RFAs Joe Pavelski, Devin Setoguchi, face off gurus, Scott Nichol and Manny Malhotra, as well as stay at home blueliner Niclas Wallin; and that bringing back Nabokov would have hindered that project.